Why? Because these automatic emails are timely, personalized and hyper-relevant to the reader. As a result, they are opened and clicked more frequently and drive visits and revenue for your business. Sound good? Then keep reading. In this guide, we’ll go deeper into exactly what automation is and show you 10 different types of automated email campaigns you can use in your own business to grow your revenue. As opposed to newsletters and one-off campaigns that you create and send to a whole list of people in one go, an automatic email campaign is set up once and then automatically sent to a particular individual when that person meets a certain trigger. To give you an example, imagine you’re Facebook and you want to send an email to somebody when they signup for an account. This email will welcome them to Facebook and show them how to get started adding friends and uploading a profile picture in an attempt to get them to become a frequent user. It would be a huge waste of your time to manually create and send an email campaign to every person when they sign up, so instead, you could set up an automated welcome email that gets sent whenever a new person joins your “Signups” list. That’s the beauty of email automation, you can set up the email once and then as more people continue to meet the trigger you defined, the email will continue to be sent to them without you ever having to lift a finger. It essentially ‘automates’ your marketing for you. To give you some ideas and help you get started, we’ve compiled this list of 10 automated emails you can start sending today that will help grow your business. According to research, 96% of visitors to your website aren’t yet ready to buy. However, these people have clearly shown interest in what you have to offer and are perfect candidates to continue communicating with to try to get them to buy later on. 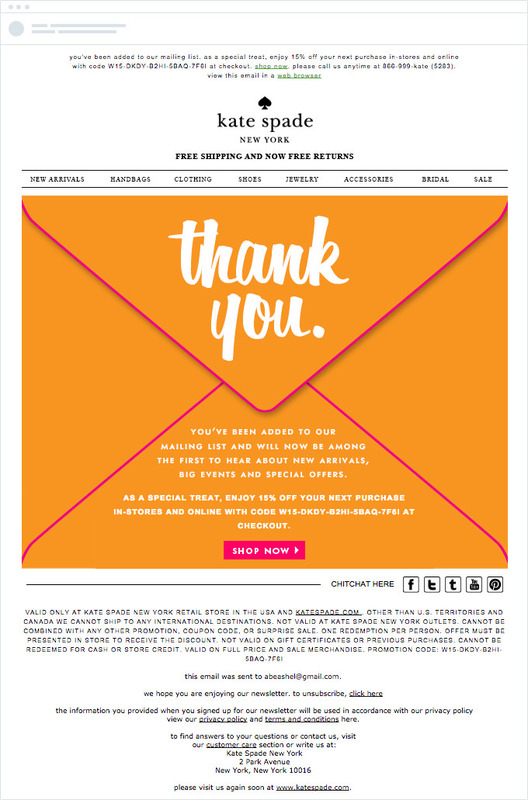 Fashion house Kate Spade does this well with their automated welcome email that goes out to new subscribers. This kind of automated welcome email can be set up in just a few minutes. You simply need to add an email subscribe box to your website that adds people to a list in your chosen email marketing tool and then set up an automated email to go out whenever someone joins that list. If your eCommerce platform supports it, you can even generate a discount code and include it in the email. Not only does this provide a great incentive for people to purchase, but it allows you to track the effectiveness of the campaign and see the impact it has on sales. Most online applications utilize some sort of free trial period to get potential customers to try the product and ultimately become a paying customer. Before people will convert into a paying customer though, they need to realize the value of your product during the trial period, otherwise, why would they start paying for it? At Campaign Monitor, before a person would consider upgrading to a paid account they need to realize the value of the product. This usually means they need to create a campaign, upload their subscriber list, and send it out. So in order to encourage people to progress through those steps and realize the value of our product, we utilize a series of automatic emails that go out to people when they create an account. 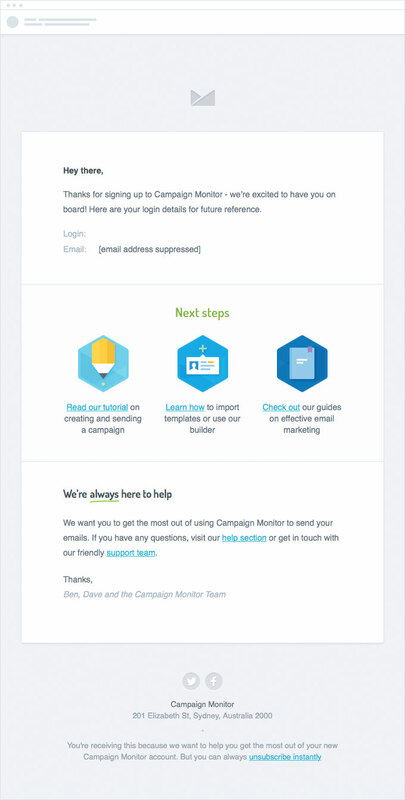 This email goes to out to everybody that creates a Campaign Monitor account and contains some basic information about their account they’ll need moving forward, such as their login URL and email address. As you can see, the email contains a prominent “Next Steps” section that features some links to help documentation and other tools. These are designed to help the user get started with Campaign Monitor and ultimately progress through to the first step of creating a campaign. 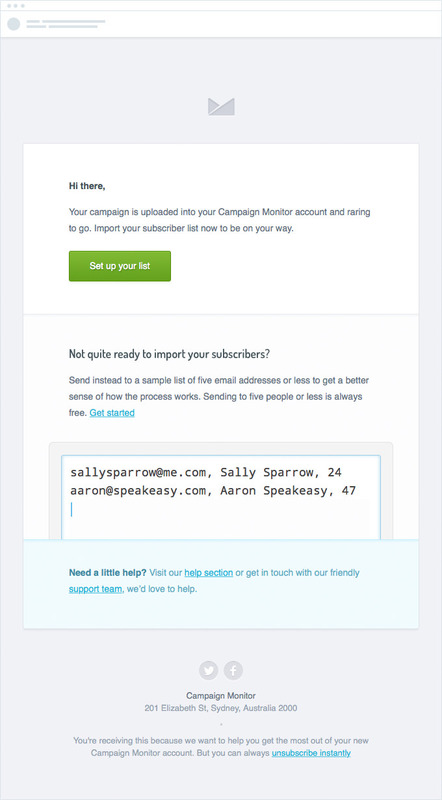 If a person has signed up for a Campaign Monitor account but not yet created a campaign, we send them an email encouraging them to do so. The email focuses on how easy it is to use our email builder to create a beautiful email campaign, and has the ultimate goal of getting people to return to the application and create and send a campaign. If a person has created a campaign but not yet uploaded and selected a list to send it to, we’ll send them an email prompting them to upload their first email list. The goal of the email is to get people to go back into the application and finish the process of sending their first campaign. It features a call to action to set up a list as well as an alternative method of sending for those who may not yet have a list built. These are relatively easy to set up with a little bit of technical knowledge or help from your web developer. In our case, we started by passing the details of new signups into a list in our own Campaign Monitor account and then set up the automated welcome email to go out instantly. Then, once a person has completed a particular event in the application (like creating their first campaign), we use the API to change the ‘Created Campaign’ custom field to ‘Yes’ on their subscriber profile. Finally, we set up a custom segment to get a list of people who meet the criteria ‘Created Campaign=Yes’ and ‘Uploaded List=No’ and then sent them an automated email encouraging them to upload their list and complete the send. Although they took a little bit of time to set up, these emails continue to be sent to everyone who signs up for a Campaign Monitor account without us having to lift a finger, and they help to grow our business by encouraging people to progress through the various steps they need to go through to become a paying customer. Building a product your customers want is hard, and it’s next to impossible if you don’t have a deep understanding of what your customers actually want. One of the best ways to get a thorough understanding of your customer’s pain points and needs is by asking them directly. Campaign Monitor customer Groove does this particularly well using an automated email campaign that goes out to new users when they sign up for a free trial. 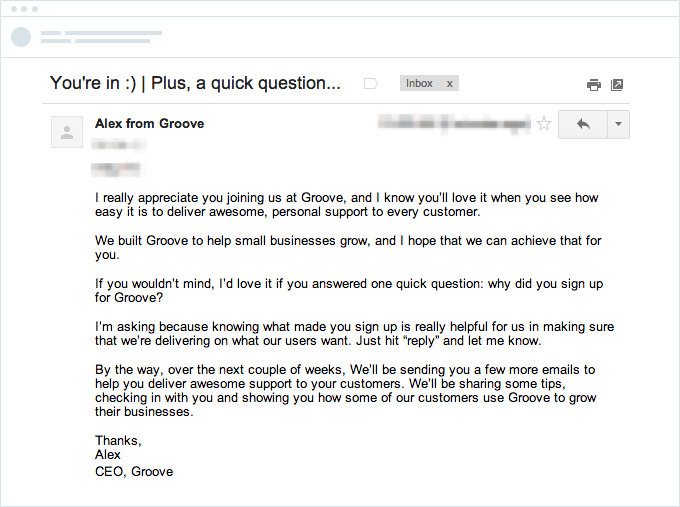 This particular email has a 41% response rate and helps Groove automatically collect a massive amount of feedback on what their customers are looking to achieve with the product, why they switched from competitor’s products, and more. This helps them grow their business in a number of ways. They can prioritize features better because they know what people are using the product for, and they can attract new customers more easily because they know why people dislike competitor’s tools and what the key messages to be putting out there are. The good news is, this kind of email is super easy to set up and you can start getting quality feedback right away. You simply add new customers or trial signups to a particular list in Campaign Monitor, and then set up an automated welcome email to go out to them when they join the list. You can then either ask people to reply directly with their feedback (like Groove does), or you can link through to surveys created in tools like GetFeedback to get more structured data. Losing existing customers can cost your business lots of money. In fact, According to Bain & Co, a 5% increase in customer retention can increase a company’s profitability by 75%. One of the best ways to make sure you don’t lose a customer’s business is to send them email campaigns informing them that their subscription, account, or policy with you is about to run out. Domain name provider GoDaddy does a great job of this whenever a domain name is about to expire. 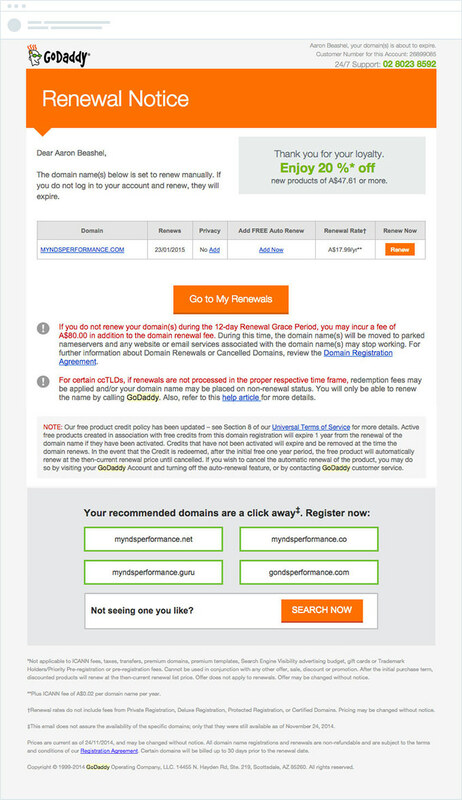 They send frequent email campaigns in the lead up to the expiration date reminding customers to renew their domain name, and even provide a discount offer and a simple call to action to entice people to renew straight away. Believe it or not, these emails are quite easy to set up. You simply pass in the expiration date of the person’s subscription or account, and then set up a series of automatic emails to go out in the days before that date. These kind of automated email campaigns are extremely effective at getting people to renew their accounts, and can help you grow your business by generating more sales and revenue from your existing customer base. Birthday emails are one of the most common types of automated emails you can send, and they can be extremely effective when done right. This email from Omaha Steaks shows how it should be done. 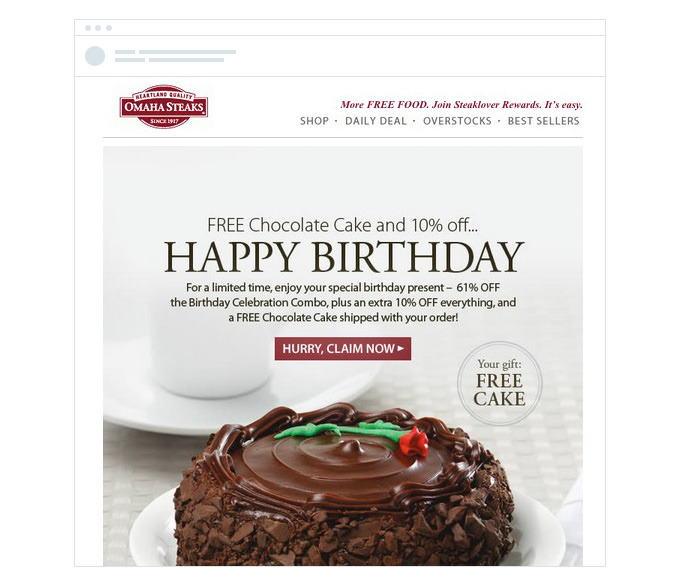 Not only does the email wish the reader a happy birthday and show they care about their customers, but it provides them with a highly -relevant birthday offer that encourages them to make a purchase. The beautiful imagery and excellent call to action help to drive conversions too. This kind of email is super easy to set up if you have your customer’s date of birth. You simply set up a recurring email based on a date, and the email will automatically be sent each time that date rolls around. Pro tip: If you are offering a restaurant voucher or something the recipient might be likely to use on their birthday as part of the celebrations, best to send it a few days earlier so they can adequately plan ahead. Repeat business is a critical driver of growth for many organizations. In fact, according to research, it costs 5 times more to acquire new customers than it does to keep your existing ones. One of the best ways to get repeat business from your existing customers is to send them regular reminder emails. This works particularly well for businesses that provide a service people use on a recurring basis, like mechanics who offer regular tune-ups or dentists who do routine check-ups and cleans. 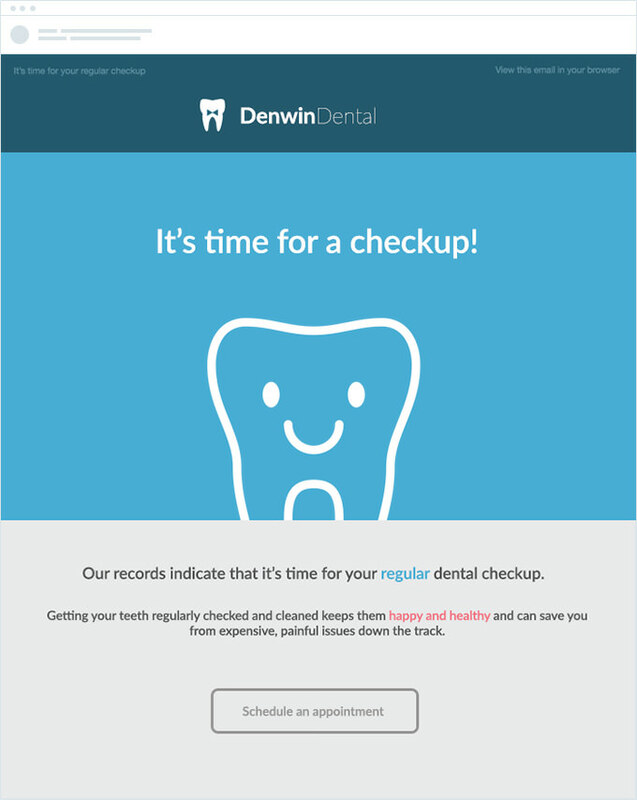 Denwin Dental do a great job of this with their fun & friendly appointment reminder email. As long as you are keeping track of your client’s most recent appointment times, this kind of automated reminder email is quite easy to set up. Use a custom date field to record when their last appointment time was, then set up the email to be sent 3 months later (or whatever your recurring schedule is) to remind them that they are due for their next appointment. This kind of email helps to grow your business by automatically reminding your existing customers to come back for another appointment, and helps increase revenue from your existing customer base. According to research, 50% of leads generated by organizations are qualified but not yet ready to purchase. The challenge with this is, how do you help move those leads along to purchase without spending too much time on them? And how do you make sure your business is top of mind when they are ready to purchase? Using automation to set up a series of lead nurturing emails can be a great way to do this. If you are using a CRM system like Salesforce or Highrise to manage your leads and sales, you can tag certain leads that need nurturing and then use a tool like Zapier to integrate those leads with your email marketing system. From there, you can send a series of automated email messages over time that educates your audience on the benefits of your product and why they should use it. Popular marketing blogger Patrick McKenzie recommends you start with a simple series of 6 emails that goes out over 30 days, and increases in “‘salesness”’ as time goes on. 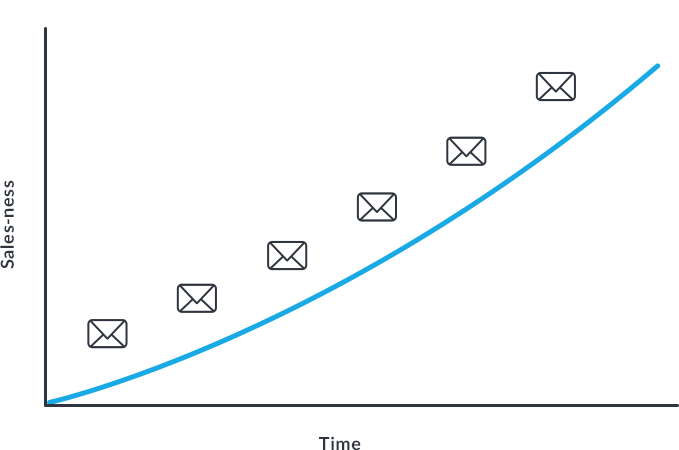 The problem email – possibilities of replacing their existing process with your product. This email should focus on educating readers on the problems associated with their current method and should barely mention your product. The benefit email – A look at the benefits of using a product like yours to achieve their goals. This email should focus on the benefits of using your category of product (I.e. using email marketing tools over mass-mailing from Gmail) and outline how doing so can help improve their lives. The transition email – Remember, every potential customer is currently using something else to do what your product could do for them, and the act of switching from that process to using your product is a barrier you need to overcome. This email should focus on outlining a simple and easy process for making the switch from their existing solution to using your product to solve their problem. The tools email – An overview of the tools available to achieve what your product achieves, almost like a quick buyer’s guide. This is the first time you introduce your product and outline why it’s superior to your competition. Include a call to action to purchase or sign up for your product for the first time in this email. The case study email – A case study on how one of your customers uses your product. Make sure to outline what problems it solves for them (tied to the problems outlined in the first email) and what benefits it brings them (tied to the benefits outlined in the second email). Include a testimonial from a customer and a call to action to signup for your free trial/free plan in this email. The resources email – The final email. Suggest some other eBooks, blogs, templates, kits, etc. for learning more about whatever it is your product does. You can also try including a discount code or special offer in this email as if you haven’t converted them from the previous emails a special offer could help tip them over the edge. While this is just an example, you can see that the focus is on educating prospects rather than making the hard sale. This kind of automated email series, when sent to the leads your business generates through your website and other marketing channels, can be a very effective way to nurture potential customers through to purchase, and help grow your business. If you run a blog as part of your company’s marketing mix, then email is one of the most powerful channels for growing your audience. So when you publish a new post on your blog, make sure you send your subscribers an email alerting them of the new post and enticing them to click through and read it. 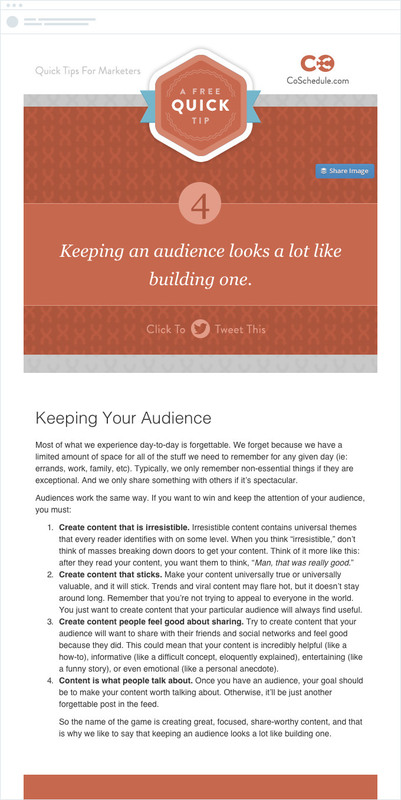 HelpScout do a great job of this with their well-designed blog post email. 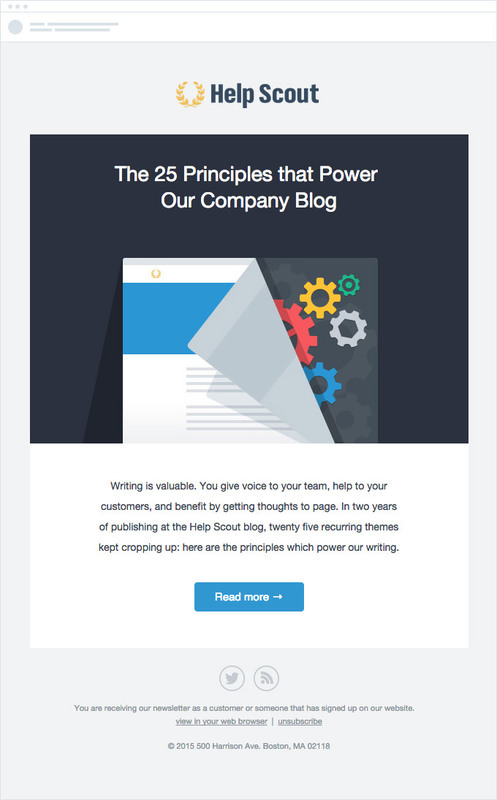 The email includes an engaging graphic as well as some compelling preview text that explains what the blog post is about. It also includes a prominent call to action to read the full post which leaves no doubt in reader’s minds what the next step should be. To do this for your own business, you simply set up an automated email that monitors your blog’s RSS feed for new posts and then automatically pulls the content in and sends the email to your list of subscribers. If you want to get more advanced, you can set the send frequency based on your recipient’s preferred contact frequency. You simply set up the email to send either monthly, weekly or daily and it will automatically pull in any content that was published since the last time the email was sent. This kind of campaign helps to grow your business by attracting subscribers back to your website to consume and share your content, keeping your business top of mind for when they are ready to purchase. Campaign Monitor customer CoSchedule do this effectively with their 6 quick tips email course. As you can see, the emails are well designed (making the content easily digestible) and each email contains a prominent call to action to get started using CoSchedule, helping to convert course subscribers into customers. The result? CoSchedule has been able to add an extra 3,000 subscribers to their email list and convert countless readers into customers. Setting up an automated email course like this is simple. All you need to do is add a form to your existing website or create a landing page to capture subscribers, then set up a basic sequence of emails to be sent out at different intervals whenever a new person subscribes to the list. These emails can help to grow your business by showcasing your expertise and authority within your industry and building people’s desire to work with your company. If your business invests time and money into running events, meetups, or webinars, then getting people to attend is critical to driving a positive return on investment. Unfortunately though, even if you get a large number of registrations only about 50% of those people will actually end up attending. A great way to increase this is to send people reminder emails in the lead up to the event, and then a series of follow-up emails after the event. The former analytics company KISSmetrics does a great job of this with their weekly webinar series. Once a person has registered for a webinar, they receive a series of reminder emails in the lead up to the webinar time encouraging them to attend live. Then, after the webinar has concluded, they automatically get sent the slides and access to the on-demand version of the webinar. As you can see, the emails KISSmetrics send are well designed and include prominent links to the slides and recording, making it easy for readers to access the content. These kinds of email campaigns can be set up quickly and easily. You simply pass the person’s email address along with the date of the event into a list in your chosen email marketing tool, then create a series of automated reminder emails that go out in the days leading up to the event. Once the event has completed, you can use the same event date field to send a series of follow-up emails. 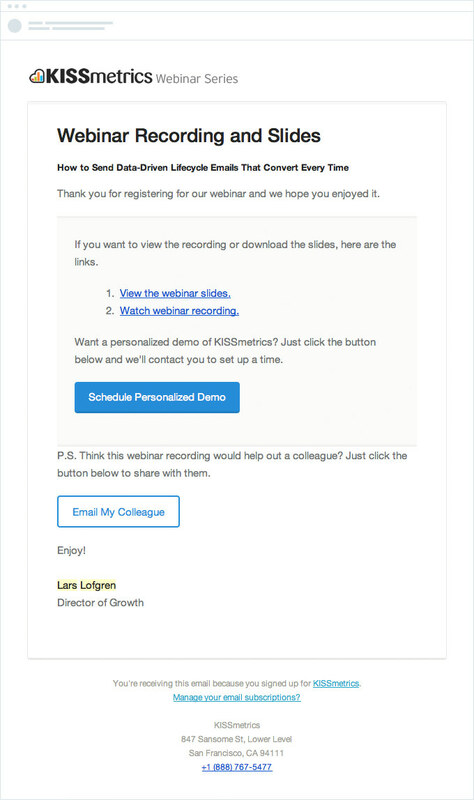 In the case of a webinar, you can send slides, and a recording like KISSmetrics does. Automated emails like the ones above can help grow your business without having to put hours of your precious time and effort into creating and sending email campaigns. However, most of the emails require you to keep your lists up to date and your customer information accurate. This can be a time consuming process if done manually, however there is a better way. Tools like Zapier provide a great way to do this. When a new contact is added to my CRM system, add the new contact to a list in my email marketing system – This zap enables you to automatically add new contacts from your CRM into your chosen list in your email marketing tool. Then, using automation you can send them welcome emails, lead nurturing emails and more. It works with a number of CRM systems, including Salesforce, Highrise, Zoho, Batchbook, Capsule, SugarCRM, Nimble, Pipedrive & more. When a new sale is made in my eCommerce platform, add the contact to a list in my email marketing software – This zap enables you to automatically add new customers from your eCommerce platform to your chosen list in your email marketing software. Then, using automation you can send them feedback emails, birthday emails, renewal notices and more. It works with a number of eCommerce platforms, including Shopify, BigCommerce, Volusion, Magento, WooCommerce, eBay, Etsy & SquareSpace. When a new customer is added to my accounting program, add the customer to a list in my email marketing tool – This zap enables you to automatically add new customers from your accounting tool into your email marketing system. From there, you can send them appointment reminder emails, product usage emails and more. It works with a number of billing & accounting applications, including Xero, Quickbooks, PayPal, Freshbooks, Stripe, WHMCS, Chargify, Recurly, Harvest, Zuora and more. When a new person registers for my event or webinar, add the person to a list in my email marketing tool – This zap enables you to automatically add new registrants from your event management tool into your email marketing system. From there, you can send them automated reminder emails in the lead up to the event and follow-up emails after it. It works with a number of event management & webinar tools, including Eventbrite, Meetup & GoToWebinar. If the tools you use to run your business aren’t supported by Zapier, you can easily build custom integrations that work for you. Most email marketing tools have an API that you can connect to, and sync whatever data you need to make your automated emails work. Just like the regular campaigns and newsletters you send, automated emails need to be optimized for conversion in order to be effective. Write great subject lines – Even though automated email campaigns are triggered off the recipients actions, they still need to have great subject lines to grab recipients attention and ensure they get opened. To help you write a great subject line, check out these 8 subject lines formulas or the 15 power words to use in subject lines. Structure your email for scanners – Research shows people don’t read email campaigns word for word like they do a book, instead, they scan the email looking for elements that pique their interest. So in order to get your message across you need to make sure your automated email campaign is structured for scanners. This post on the subject outlines exactly how to do it. Use compelling copy – It’s important in your automated emails to create desire towards the conversion action, and there is no better way to do this than by using compelling, benefit-focused copy. We regularly use copywriting formulas such as the PAS formula or the BAB formula to achieve this in our own email campaigns, and they are two resources worth checking out. Alternatively, if those formulas don’t quite fit the message of your email then use these 5 persuasion techniques to help you write email copy that converts. Use a call to action button – We ran some tests recently and found that including a call to action button (as opposed to just text links) increased our conversions by 28%. So when creating your automated email campaign, make sure to include a call to action button to increase your chances of people clicking through and taking your desired conversion action. It’s also important to optimize your call to action buttons, and this post provides a 3 part framework for creating the perfect CTA button. Measure your results – Most email marketing tools will give you comprehensive data on email-related metrics like opens, clicks, etc. Some will even show you a real-time world map of people engaging with your email. However, to truly measure and optimize the results of your automated email you need to go beyond these metrics and look at the fundamental numbers that matter to your business, things like visits, customers and revenue. Google Analytics is a powerful and free tool to use to do this, and we’ve made a free Google Analytics dashboard that you can use to measure the effectiveness of your email marketing at a glance. If you’re more of an advanced user, check out our 4 favorite Google Analytics reports for measuring email marketing. As a marketer, you likely have more and more things competing for your limited time and resources. However, of all the opportunities available to you to grow your business, email marketing still remains one of the most impactful, and setting up automated emails can help you drive results without having to spend time working on them over and over again. So take some of the ideas for automated emails presented in this guide and apply them to your business. Tools like Campaign Monitor make it incredibly simple to set up automated email campaigns and you can have them driving revenue for your business for years to come.